For my birthday this year, The Hubby and I celebrated with dinner at Yunaghi. 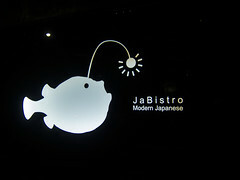 The Japanese restaurant specialized in set menus featuring French-Japanese fusion dishes that appeal to every sense. Plating was stunning, with each leaf and drop of sauce placed delicately and exact. The visual appeal was only second to taste. 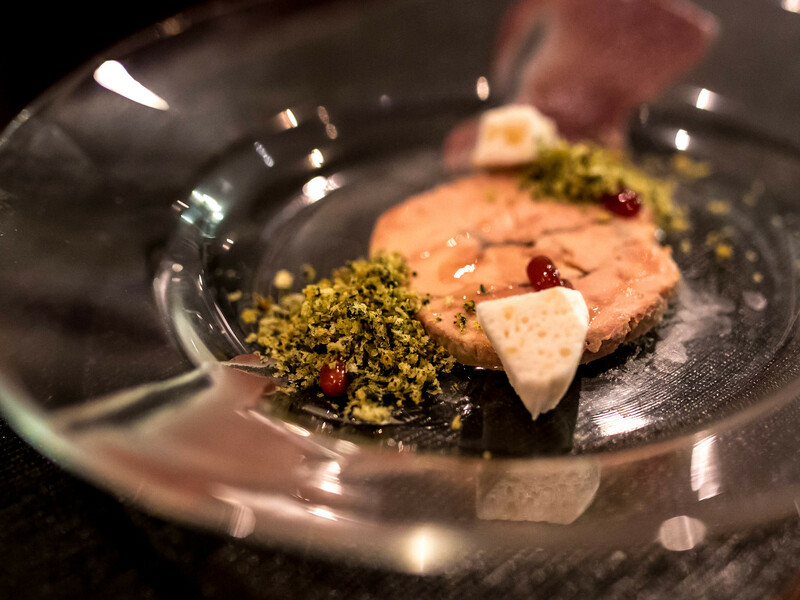 Each course was an exercise in balance between acidity, sweetness, richness and air. I have no doubt my meal at Yunaghi will rank high in my top eats of this year. I struggle with this post to accurately transcribe my dining experience into words when the restaurant has been showered with accolades from professional reviewers much more eloquent than myself. 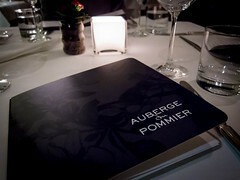 Atmosphere: Yunaghi took over the space that was previously Ici Bistro and there have been minimal changes to the decor. An open kitchen spans the back of the restaurant giving every seat a behind the scenes view. The dining room was small, on the main floor of a converted house and consisted of square tables and elevated bar stools. One row of bar seats faced the kitchen and another, where we sat was along the bar. 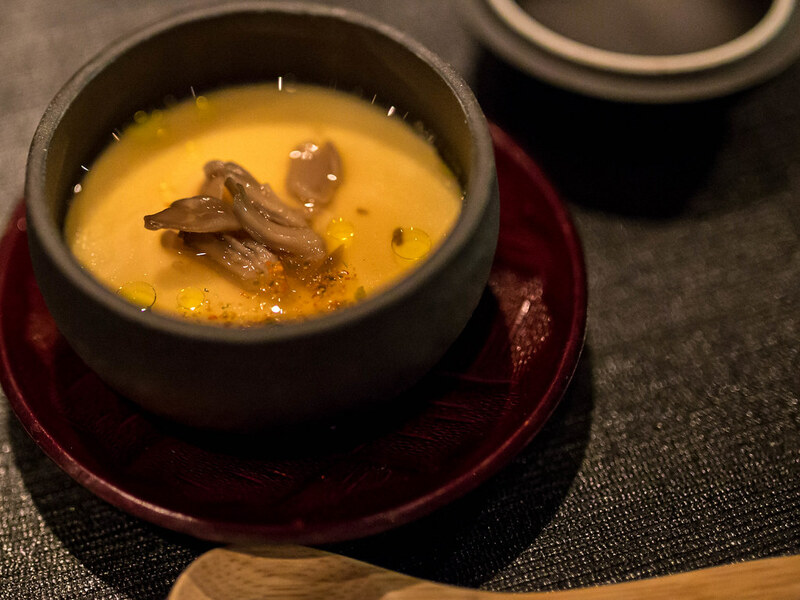 Within the intimate room, it was hard not to overhear conversations but with the steady stream of courses and sake, we were mostly enjoying the food more than conversing. 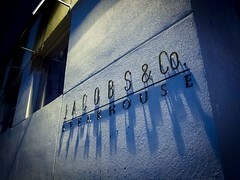 This was a unique dining experience, calm, peaceful and refined, perfect for a special occasion. Service: In a word, superb. 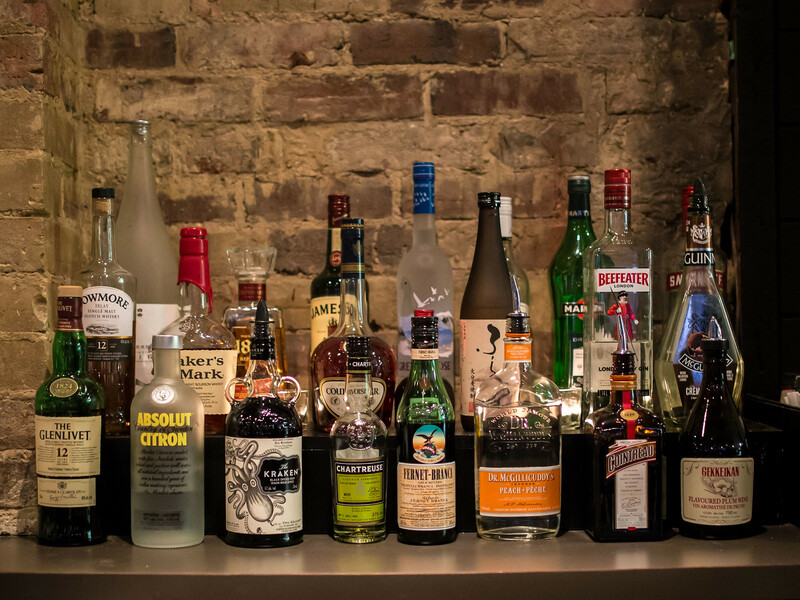 There were two main servers we interacted with along with the bartender. 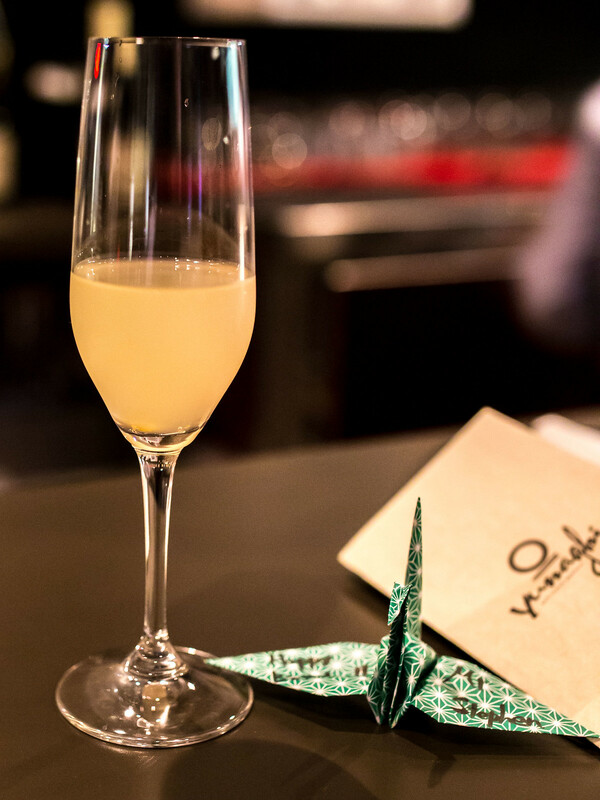 Each course was introduced in detail with ingredients and methods of preparation. 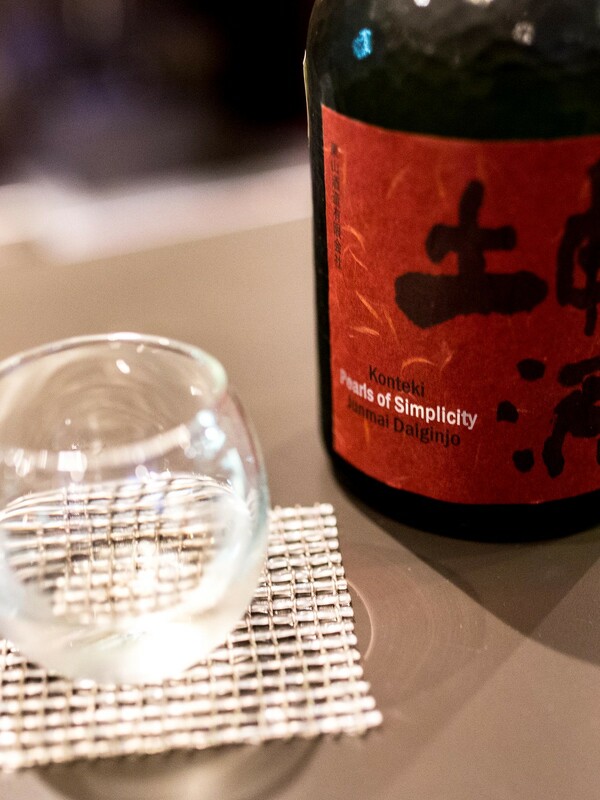 We ordered the sake pairing along with our meal and the bartender introduced sake with tasting notes and their region. When he noticed The Hubby taking pictures of the glass, he brought us the sake bottle as well to play with. 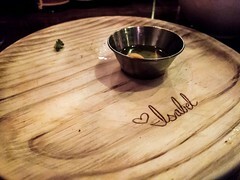 Service was efficient as well and there was no lull in between courses. We didn’t even realize that the meal had taken over 2 hours to enjoy. 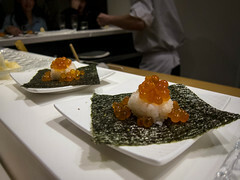 Food: Looking back on our meal at Yunaghi, I believe the pictures tell the story best. 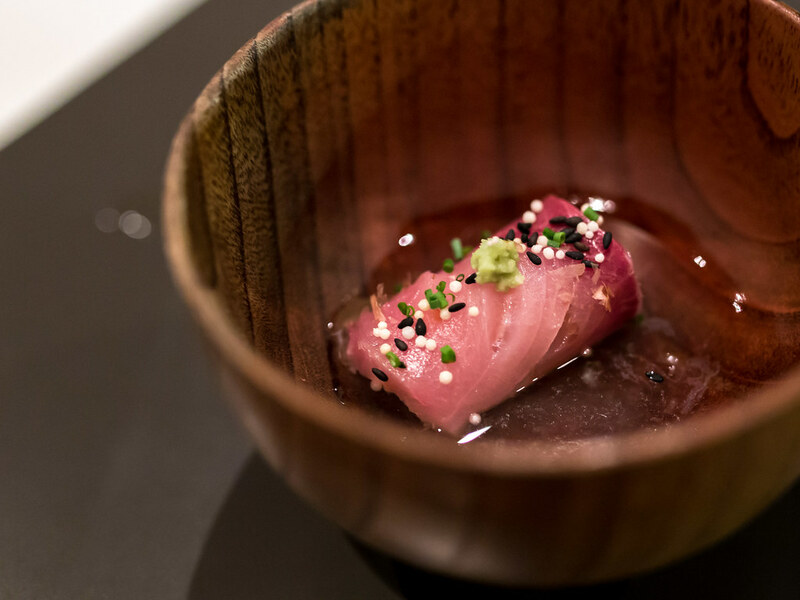 Starting from the amuse bouche of sashimi doused with a green tea dashi mixture to a coriander mousse dessert, Yunaghi blends delicate Japanese flavours with intricate French cooking techniques. 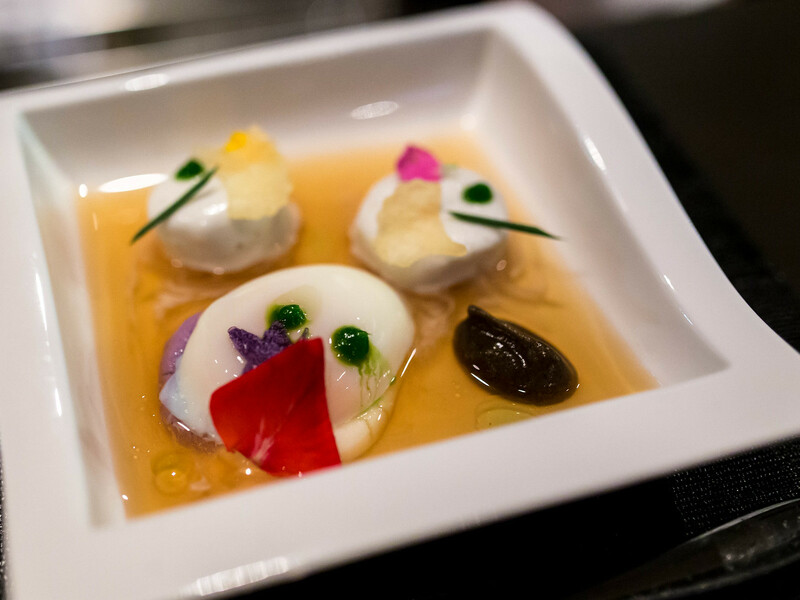 There’s foam, cheese, creams and foie gras, accented with yuzu, wasabi and nori. There were three set menu to choose from, 7 (choice of chicken/fish and one of two desserts), 9 (chicken, fish and both desserts) and 11 (9 courses + otoro and foie gras) courses. We decided to try one 9 course meal and one 11 course meal. 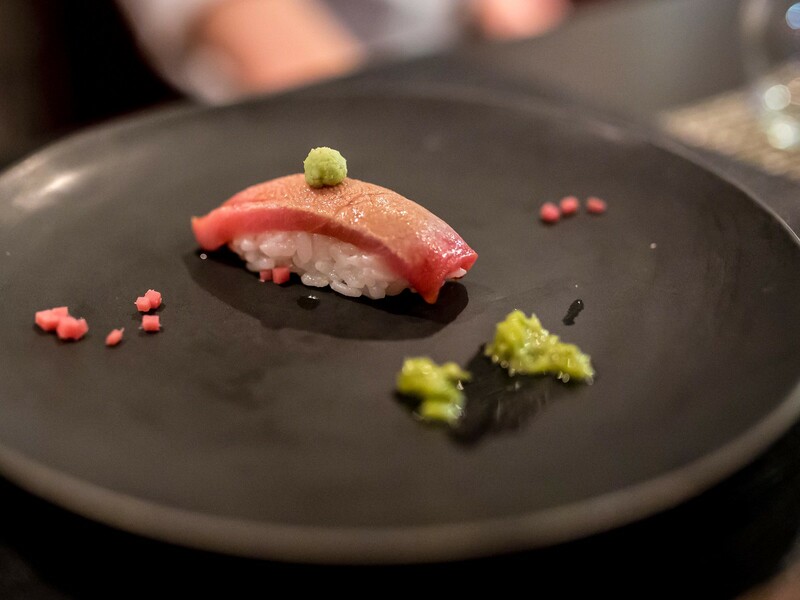 After comparing the two, the addition of otoro and foie gras was definitely worth the price difference and both were highlights of the evening. 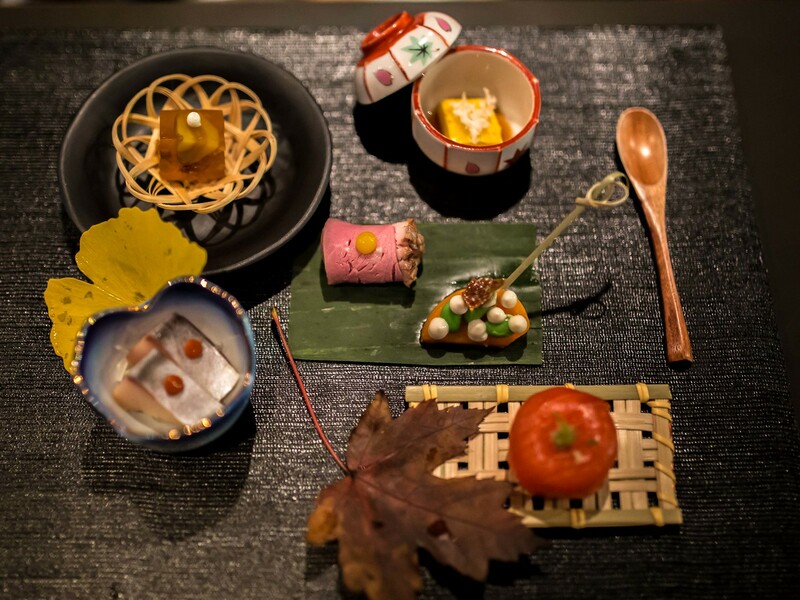 Not quite kaiseki, but the closest so far in Toronto, at Yunaghi, the flow of dinner and themes of each course stays constant, while the ingredients change often. Our appetizer began with chestnut helly, saba sashimi, a slice of roast duck, wedge of persimmon, squash tofu and salmon temari roll. This was just the first course, a stunning start. 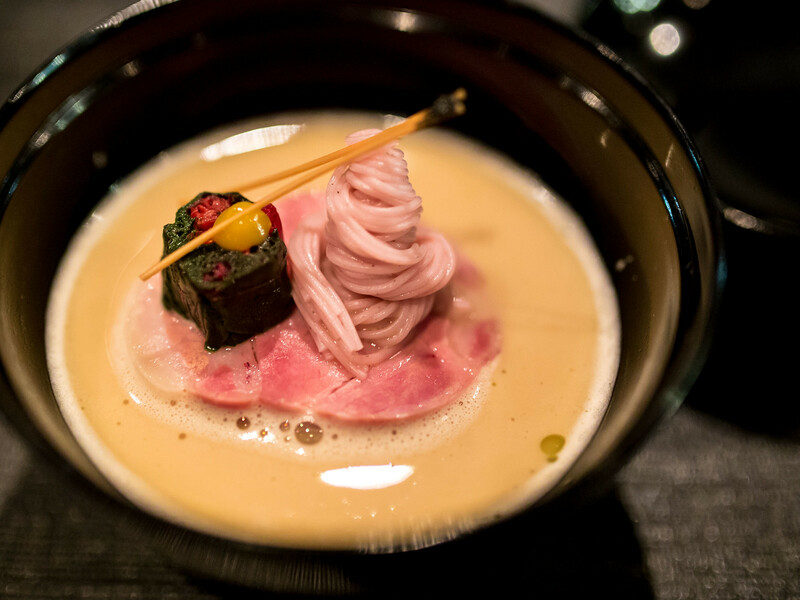 Next was a silky, rich ramen broth with a spindle of coiled somen balanced on a slice of chashu. Course three was a piece of melt-in-your mouth otoro. Vege course was next and had a perfect onsen egg, creamy and soft. Course # 5 was chawanmushi, tea cup steamed egg with hen of the wood, shaved grana padano, dusted with nori shichimi. My plate of foie gras then arrived. A generous portion, served with slices of toasted bread and nori butter. That nori butter, to die for. 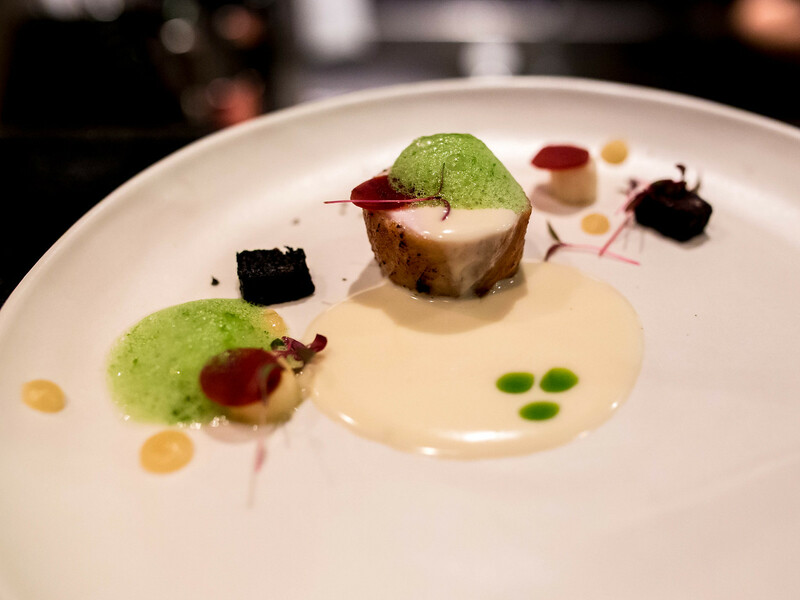 This course was a tribute to indulgence, buttery soft textures and rich fatty flavours. Our next two courses were the meat entrees, a fish and a chicken. 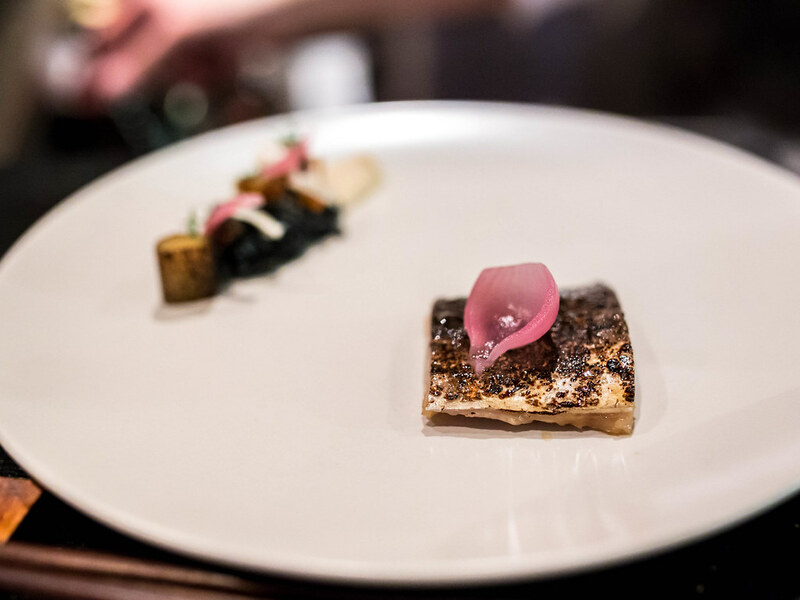 The fish was spanish mackerel, grilled and in the corner was a collection of seasonal vegetables arranged like a scene out of the woods. The details at Yunaghi wowed me. 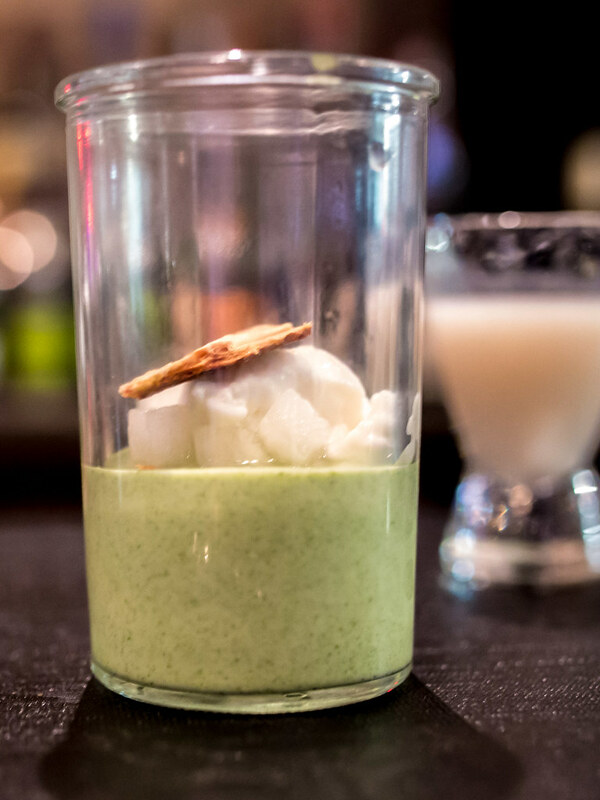 Nestled in a pool of cream, a disc of tender chicken was doused in arugula foam. Every dish was almost too pretty to eat. 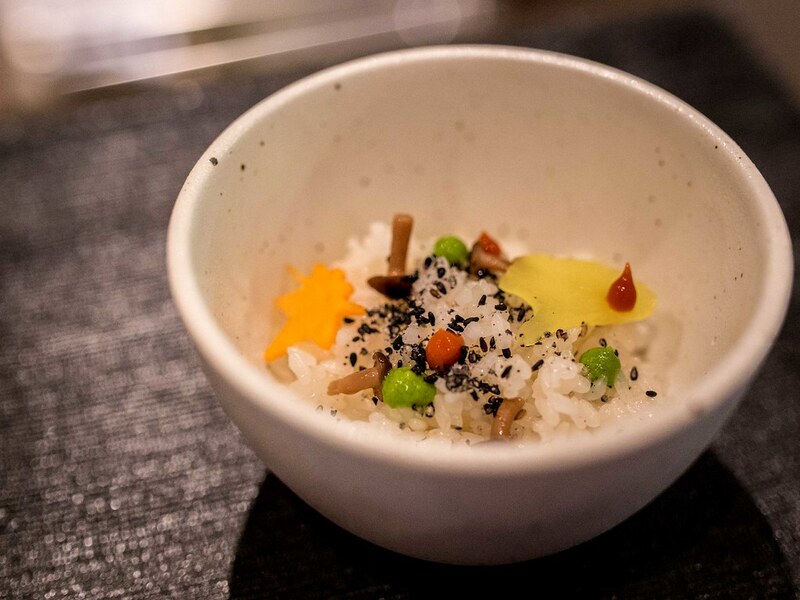 The last course before dessert was a bowl of seasoned Japanese sticky rice, topped with sesame seeds and tiny mushrooms. I could almost see little forest elves assembling this bowl in the kitchen. Dessert was a two course affair, the first being a coriander mousse topped with coconut pear jelly and chili meringue. The textures of this dish all screamed dessert but the flavours were all savoury. My tastebuds were pleasantly confused. Dinner ended on a more traditional sweet note with a chocolate terrine on key lime foam. 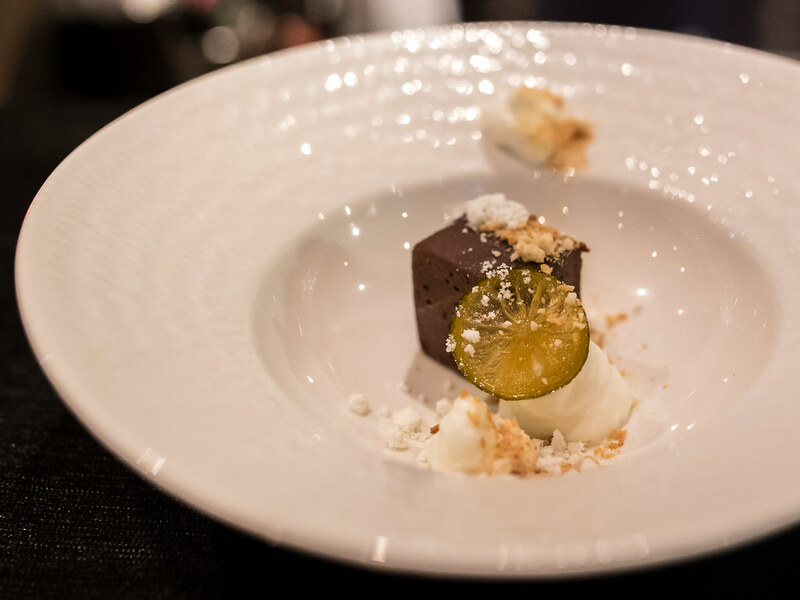 A reflection of the previous 10 courses, dessert was an ideal balance of sweet and sour, crunchy and airy.